ANN ARBOR, Mich. - Sept. 24, 2018 - PRLog -- Xitron, the leading independent developer of RIP and workflow products for commercial, digital, flexo, and high-speed inkjet printing has begun shipping the next generation of Harlequin RIP; Navigator 12.0r1. After months of in-depth quality testing by Xitron engineering, Navigator 12, with PDF 2.0 compatibility is ready for deployment. Navigator 12 will be one of the first PDF 2.0 compliant RIPs available in the commercial market. "This has been one of the most anticipated RIP releases in recent memory," said Karen Crews, President of Xitron. 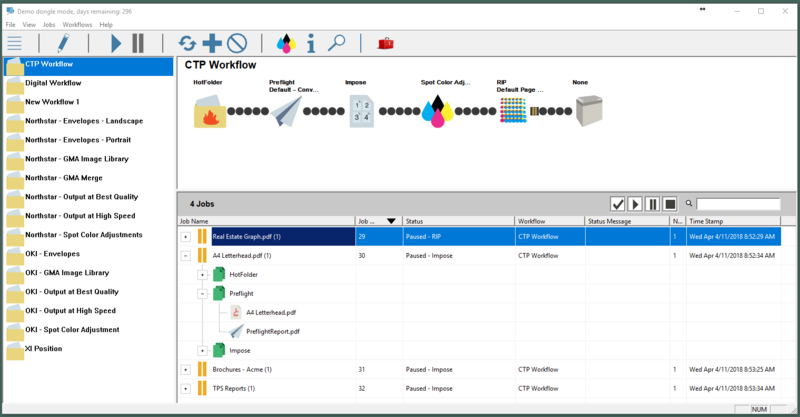 "It is vitally important that we get this into our customer's prepress operations before jobs in PDF 2.0 format become the norm, rather than the exception." The PDF 2.0 specification was published just over one year ago and development of a Harlequin RIP capable of complying with the specification was running in parallel with the anticipated final specification. "Pre-release testing is the crucial step in the delivery process," said Crews. "It's not just a matter of verifying that print jobs process properly. It's also ensuring that the RIP works with the thousands of computer to plate, computer to film, and computer to press interfaces that Xitron supports around the world." Xitron is expecting to fulfill upgrade requests from hundreds of Xitron Navigator, RTI, Compose, and ECRM RIP users over the coming months. Navigator RIPs drive CTP and CTF engines from Agfa, Screen, Fujifilm, Kodak, MarkAndy, ECRM, and Heidelberg, just to name a few. In the digital market, the Navigator-based Digital Front End drives high-speed inkjet presses from manufacturers such as Colordyne, Printware, Neopost, Trojan, Superweb Digital, IPT, AstroNova (QuickLabel), and many others. Navigator even drives presses using the latest VersaPass and Duralink head technology from Memjet, as well as presses using inkjet heads from Konica-Minolta, Kyocera, Xaar, Fuji Dimatix, Ricoh, and Kyocera. "Navigator version 12 is now in position to drive the widest variety of output devices of any RIP offered today," continued Crews. "This makes it the perfect choice for any shop running conventional offset or flexo while exploring digital options for their future." Existing Harlequin RIP users can get information about upgrading to version 12 by contacting Xitron at 734-794-8083 or visiting https://www.harlequinripupgrade.com/. Most Harlequin RIPs from version 5 onward can be upgraded to insure interpretive accuracy for PDF 2.0 jobs or PDF 1.7 jobs that contain transparent elements. Prepress operations interested in investigating PDF 2.0 compliant RIPs or workflows to replace their existing systems can call the same number or write to xitronsales@xitron.com. Xitron develops advanced workflow systems and interfaces to drive the prepress industry's most popular new, and legacy output devices, prolonging our customers' investments. In addition, Xitron's pressroom workflow solutions extend the functionality of press consoles from a number of industry-leading press manufacturers. Xitron's Navigator RIP, Raster Blaster TIFF Catcher, and Sierra Workflow solutions are recognized as prepress standards. Built around the Harlequin RIP core technology from Global Graphics and the Adobe PDF Print Engine from Adobe Systems, Xitron engineers continue to develop solutions for the graphic arts market, driving hundreds of different models of imagesetters, proofers, platesetters, inkjet printers, and digital presses. With shipments of more than 35,000 RIPs, Xitron is the largest independent provider in the market. For more information about Xitron, visit us at www.xitron.com. To update contact information or request removal from our editorial mailing list, send an email to bfarrah@xitron.com.